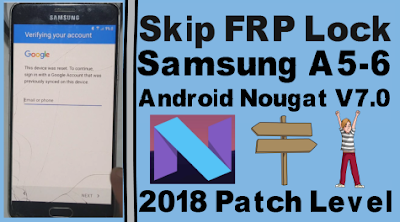 Home / How To Skip FRP Lock On Samsung A5-6 Android V7.0/2018 Patch Level. / videos / How To Skip FRP Lock On Samsung A5-6 Android V7.0/2018 Patch Level. How To Skip FRP Lock On Samsung A5-6 Android V7.0/2018 Patch Level. Skip FRP Lock On Samsung A5-6 Android V7.0 Required File. A5 (2016) SM-A510F Frp Lock Remove Method.